Again, this is where test automation can help, and if done well, without being an implementation or maintenance burden. Many test automation efforts are blind to the very Agile idea of YAGNI or You Ain't Gonna Need it . They often presume to know all that needs to be tested in advance, deciding to invest most of their time writing 'tests' blindly against a specification, that is as-yet un-implemented. This example shows how simple test automation based on your own feedback during testing can be very powerful. I had the idea that the Guardian Content API might be overly fussy with its inputs. Often software is written [and tested] using canned data, that's designed 'to work'. These data inputs usually confirm to a happy path, and even then, only a subset of the data that could be considered 'happy path' is used. Using the Guardian's own HTML GUI ( API Explorer ) that allows you to easily query the REST API, by hand, I tried a few quick tests. These included, some random text as well as a few typical characters that are likely to occur in text but I suspect would not be present in the usual canned test data. For example, a single SPACE character. That quick test, of the SPACE character highlighted an issue. Entering a single SPACE character into the Tags search API explorer, appeared to cause the HTML GUI to not return a response. The API Explorer appeared to hang. At that point, I didn't know the cause, the issue could be a problem with this developer-GUI, and not the API itself. A closer examination using Firebug, clearly identified the cause as a HTTP 500 Error from the server. 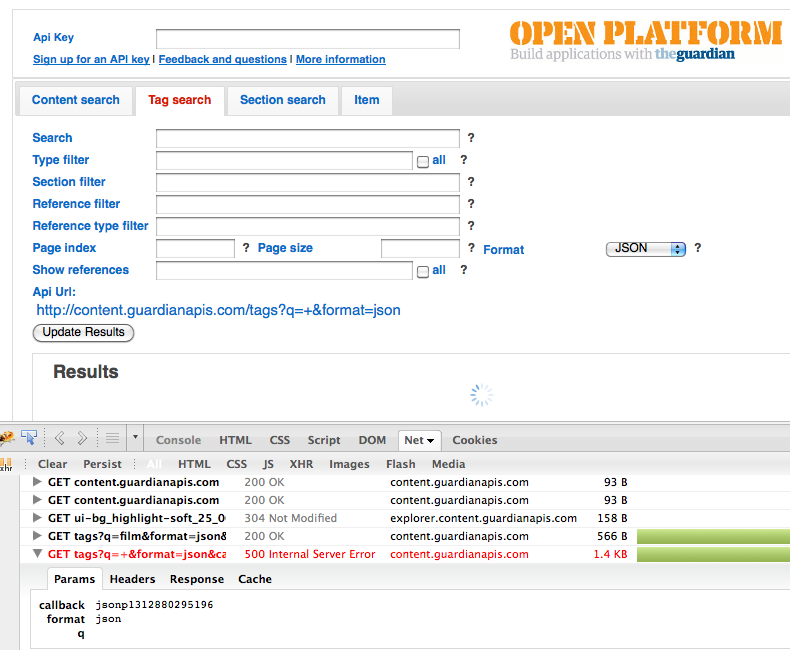 Failing query using Guardians Tags Search API - Firebug showing the HTTP 500 Error. I could have reported this one issue. That despite the documentation stating any free text is ok for this field a simple space character can expose a failure. But using some simple automation I was better able to define the extent and distribution of this issue. For example, is it a general problem with entering single characters? Does it only affect one part of the API? The output of the above was directed to a file, and used as the input for my API-script. The script now reads one ASCII character at a time and uses that character to query the Guardians Content API. As I had found this issue in the Tags Search I also ran this script against the Guardians Tags search API. This is ideal ground for test automation, there are 128 ASCII characters, and I'm examining 2 services, making 256 queries. That's too many to do by hand, but trivial for a simple test automation script. Common characters that are not available in ASCII, are nonetheless very common in English. And therefore will be present in the body and headlines of the Guardians content. A simple example is the € (euro) symbol. The script would also allow me to query these many [millions of] non-ASCII characters if my current testing suggested that it might be fruitful. Table indicates non-HTTP 500 response codes, and the corresponding queries. The results when filtered to only show non-HTTP 200 results clearly indicate the Tags API is less robust that the Content Search API, over these inputs. For example the space character produced no error in Content Search but did in the Tags Search. The same is true of the Horizontal tab, both characters that might be present in 'any free text'. What code is shared between the two services? There are clearly some differences. How do the two APIs handle these characters in combination? with each other or 'typical' english words. As error handling code is itself often flaky, what new bugs can I find in the Tags search API? How badly will the APIs, in particular the Tags API, handle non-ASCII characters? Should the APIs handle all UTF-8 codepoints without exposing failures? As far as the product owner is concerned, What is expected behaviour when a character is not-accepted? Light weight, easy to build test automation that lets the team quickly get a mental-model of how the software actually-works is clearly valuable. I'm using the computer to do the laborious work its good at, extending my reach as a tester to help me see the bigger picture. Showing that there is more than just one isolated character not being handled well, but in fact the Tags Search API is generally a lot more prone to failure. This, more exploratory, automation is freeing me to do analysis and face to face communication with team members and product owners. Allowing me to adapt quickly to those discussions and how I see the software behaving, a fundamentally more Agile (and agile) approach. This is excellent stuff. Great to see you exploring but using the tools to help you, rather than doing a massive up front framework design for the automation.